Last year, I learned to love the Extreme Writing Event. As part of the Emerging Writers’ Festival, I took part in some of the writing-time at the Rabbit Hole. A few weeks later, I spent a day doing something similar, and wrote 10,000 words in a day at the Future Bookshop. And the last semester of uni was really an Extreme Writing Event in itself. In about three hours, Melbourne’s White Night event will kick off. This event will see the city running non-stop for a whole night, with performances, projections, exhibitions, and miscellaneous others happening all over the city. As part of White Night, Emerging Writers’ Festival are hosting a writers-friendly space right through from 7pm until 7am tomorrow morning. There will be performances every hour, and cosy (comfortable?) space to chill out and get some serious writing done. For me, it starts with a cupcake. I always feel good about things when I can contribute some delicious treats. I have a fridge full of these bad boys, ready to spike our blood sugar levels and get us through the night. 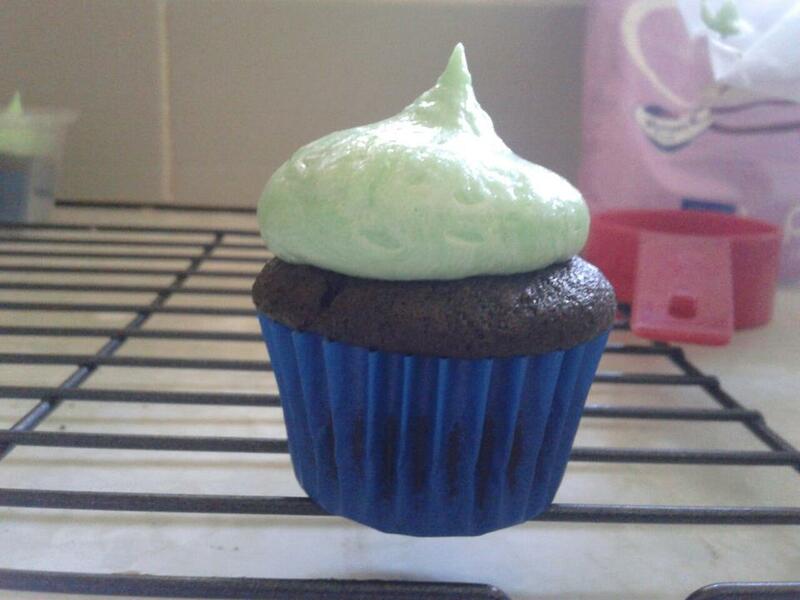 Chocolate with mint icing. Yummm! If I learned one thing from last year’s Extreme Writing Events, it was the power of planning. I reached that 10,000 words in a day because I’d planned pretty carefully what I wanted to get written. So again, I’ve armed myself with a notebook full of jottings toward articles, and tweakings toward half-written pieces. This event is much easier, in that there’s no word-count goal. Managing to stay awake and somewhat productive is really the aim. This said, I’m still really keen to use the time to get something done. I have a writing exercise here that I’ve been given by my mentor, and I plan to knock that over. After that, I’ll be getting stuck into a piece I’ve been planning (but not yet writing) for quite a while. If I can get down a decent draft of that piece before leaving, I’ll be a happy girl. What happens to people when they get delirious and tired is fascinating, so I’m looking forward to scribbling down some notes for a piece about White Night itself. Other than that, I’ve got a good book, and a notebook, and cupcakes, and I’m now going to go take a nap to help me through the night. Working 10-5 tomorrow! Hope to see you out at White Night. Hey is it over yet? How did you guys go?? It’s over, Sarah. It was intense and wonderful. I really hope they do it again.